Important documents could be identified by their own "fingerprints"
A low-cost laser scanning system could help in the fight against document and ID fraud, according to its developers at Imperial College London. The Laser Surface Authentication (LSA) system scans tiny surface variations of paper, plastic, metal and ceramics to detect the material's "fingerprint". The system then records the naturally occurring pattern of imperfections. The imperfections are so minute, say the scientists, that they are virtually impossible to replicate. "A unique 'fingerprint' is formed by microscopic surface imperfections on almost all paper documents, plastic cards and product packaging," explained Professor Russell Cowburn, professor of nanotechnology at Imperial College, London. "That is what makes it possible to develop a much cheaper method to combat fraud because this inherent identity code is virtually impossible to modify. It can easily be read using a low-cost portable laser scanner." It could be used on materials such as passports, ID cards, credit cards, music or software CDs and DVDs, banknotes, and packaging. He said the system signalled a shift in the approach to authentication and ID techniques. 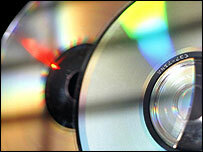 It offered a much simpler and largely foolproof, in-built - thus cheaper - way to authenticate and track sensitive documents than current methods, such as holographs. 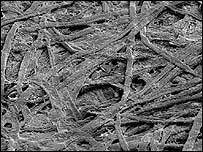 The "fingerprints" of the materials are made up of different variations of ridges and grooves which characterise materials, a few hundred nanometres in size. The Imperial College and Durham University scientists used an optical phenomenon known as "laser speckle" to detect the variations in surfaces. Laser speckle occurs when a focused beam of laser light scatters over a random system, such as the surface of paper. The scanner records the way the laser light is reflected off the surface of the paper or plastic. The speckles, as with human fingerprints, are almost unique, said Professor Cowburn, who described the system in the journal Nature. He said it could help to clamp down on fraud, drug counterfeiting, terrorism and identity theft. A quarter of UK adults have had their identity stolen or know someone who has fallen victim to ID fraud, a survey suggested earlier this year. It is one of the UK's fastest-growing crimes, with criminals netting an estimated £1.3bn last year. There are also concerns over passport document fraud following the London Underground bomb attacks. Leader of the Commons, Geoff Hoon, suggested last week that extra passport checks could be brought in as ministers looked into how a London bomb suspect was able to leave the UK. 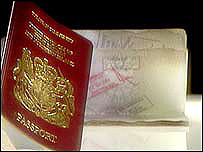 If deployed, it means that a passport, for example, could be quickly scanned using the system and its laser speckles recorded and encoded in a unique serial number or onto a database before being issued. It could then be quickly re-scanned and checked against its record when authentication is required. The laser system, which includes a low-cost, portable scanner, is extremely accurate, according to the research team, and it also still recognised surface patterns after the materials had been abused. Different materials were handled roughly, placed in water, burnt, scoured with an abrasive cleaning pad and covered in black marker pen, but the laser was still able to read the surface fingerprint. "The beauty of this system is that we do not need to modify the item being protected in any way with tags, chips or ink - it is as if documents and packaging had their own unique DNA," said Professor Cowburn. The system, according to the researchers, makes spoofing the unique document fingerprints extremely difficult, if not impossible currently, because there is no way to replicate the surface structures artificially.